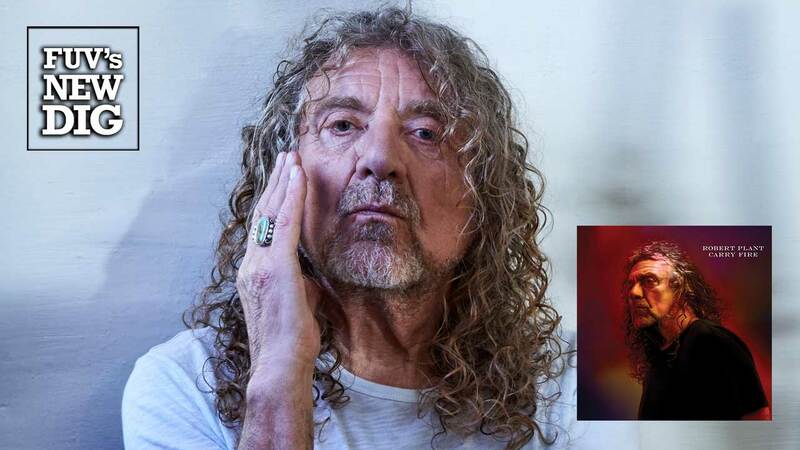 Forty-nine years after joining the band that would become Led Zeppelin, the formidable artistic legacy of the magnificent Robert Plant carries on. Plant has returned with Carry Fire, his 11th solo album (he has also released collaborations with Jimmy Page and Alison Krauss) since Led Zeppelin disbanded in 1980. In his post-Zep career — and 35 years since the release of his solo debut, Pictures at Eleven — Plant has masterfully embraced a contemporary outlook while reaching beyond the rock spectrum. He cleverly taps into his own legacy by keeping his accomplishments with Led Zeppelin at a convenient distance — close enough to serve as both inspiration and embellishment, but far enough away so as not to cloud his forward-thinking approach. At 69, Plant has eased into the role as rock’s sage. The music on Carry Fire, which again partners Plant with his band, the Sensational Shape Shifters, draws its strength from an inner flame and not from sheer volume: Plant sings in a mannered, soft voice, as if sharing ancient words of wisdom. His music is an ethereal sojourn through a mysterious night, where a star-filled sky evokes a romantic setting. The diversity of Carry Fire is further displayed in the moody jazz off “Keep It Hid” and a cover of an Ersel Hickey classic, “Bluebirds Over The Mountain,” which features a guest vocal appearance from Chrissie Hynde. Here, Plant dips his toe back into the Americana waters he tested on Raising Sand, his 2007 collaboration with Alison Krauss, and 2010’s Band Of Joy, which featured Buddy Miller and Patty Griffin. The Sensational Space Shifters, who were also on board Lullaby and ... The Ceaseless Roar, are Plant’s band, executing his visions. They are: John Baggott (keyboards, drums and percussion, guitars, brass arrangements), Justin Adams (guitars, percussion), Billy Fuller (bass, keyboards, drum programming), Dave Smith (drums and percussion) and guitarist Liam “Skin” Tyson. Baggott, Adams, Fuller and Tyson are all holdovers from the Strange Sensation, the band that accompanied Plant on 2005's Mighty Rearranger. In addition, Baggott’s and Adams’ time playing with Plant goes back even farther - to the 2002 album, Dreamland. All of the songs on Carry Fire, except “Bluebirds Over The Mountain,” were written by Plant with some combination of Adams, Baggott, Fuller, Smith and Tyson. Carry Fire is a vibrant collection of songs that speaks powerfully to this era, its politics, and its contradictions. It's also a testament to Plant's artistry; over the past decade, he's released some of the strongest albums of his solo career. Few musicians have been able to constantly transform themselves quite like Plant, with such ease, grace and inspiration. Learn more about 'Carry Fire' in Paul Cavalconte's interview with Robert Plant on FUV Live. Listen on Monday, October 30 at 8 p.m. EDT on WFUV or anytime in the Vault.